Enjoy the benefits of cast iron with the Camp Chef's exclusive 11 inch Square Skillet. The Square Skillet is great for all your typical skillet cooking and fits nicely over a one burner stove to maximize heat efficiency. Four sandwiches fit perfectly inside to cook all at once, great for French toast too. Pre-seasoned so it's ready to cook and easy to clean up and maintain. Cast iron Dutch ovens are known for making some of the most delicious meals, from slow roasted meats to your favourite fruit cobbler. When cooking with this deluxe six quart, 10" Dutch oven your menu will expand because the lid doubles as a full size skillet. Simply turn the lid over to cook eggs, bacon or pancakes, then replace the lid and start cooking your favourite potatoes for the next meal. 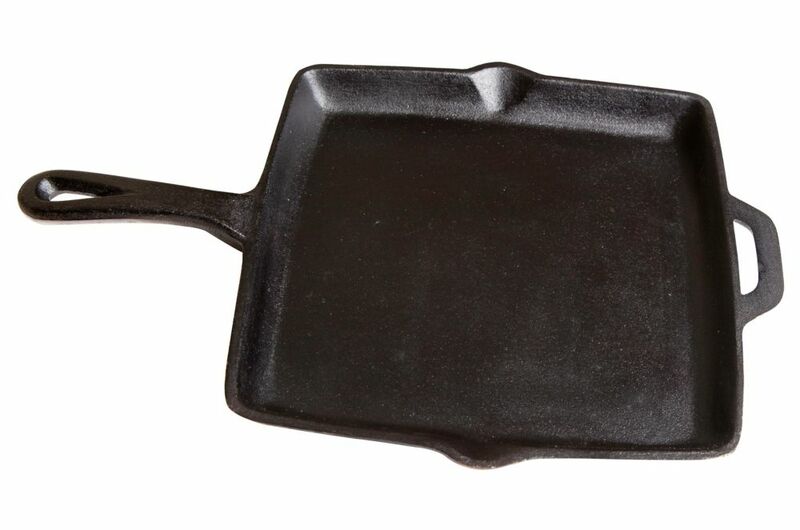 11 inch Square Skillet Enjoy the benefits of cast iron with the Camp Chef's exclusive 11 inch Square Skillet. The Square Skillet is great for all your typical skillet cooking and fits nicely over a one burner stove to maximize heat efficiency. Four sandwiches fit perfectly inside to cook all at once, great for French toast too. Pre-seasoned so it's ready to cook and easy to clean up and maintain. 11 inch Square Skillet is rated 1.0 out of 5 by 1. Rated 1 out of 5 by Jo 53 from not my best piece of iron I got this for Valentines day, i put 3 coats of seasoning on it, and yet everything stuck. It has a prominent high center and all the oil drains to the corners. I am very disappointed with this product! When i washed it, the seasoning started flaking off. I will have to totally strip it and start again.